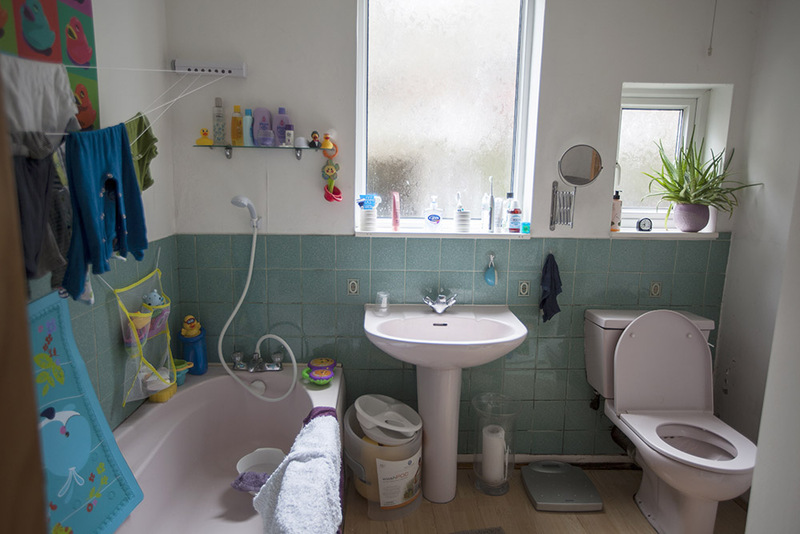 Bathrooms & sculleries | WE: the ex-Warner Estate in Waltham Forest. S: My mother had lived in Warner properties in Warner Road all of her life. She was one of five children, and they lived in what would have been a 2 bedroomed flat, now, without a bathroom. Neither of us had access to a bathroom until we were in our mid twenties, and we talk about this quite often, that you see these free-standing baths now, but we had our own free-standing bath, we called it a bungalow bath. It was a metal, galvanised tin bath, that hung up in the garden, and that’d be brought in on a Friday evening, and we had a large copper in the kitchenette, that used to be a scullery, when Warner’s built them they were sculleries, and it would be a gas fired copper that we’d fill up with cold water and start boiling, sort of early Friday evening. That was also used to do the washing each week, that would be done on a Monday and would be taken out into the garden to be mangled and hung on the line. But Friday night would be bath night, they’d fill up the bath and then the youngest would go in first, then when that person came out- that was my brother- then they’d empty out some of the water and more hot water would go in for me, then we’d get sent off to bed and then it’d be Mum’s turn, then it’d be Dad’s turn, by which time it’d be like pea soup, because you’d take out as much water as possible but you couldn’t get the last bit out. B: We lived upstairs, and we had a little balcony where the stairs went down to the garden, we had a longish garden, that backed onto the railway, the Kentish Town to Barking line, and we had what we called the Penthouse, which was Mr Wood who lived a few doors up, he built us an outhouse on the balcony, but it had an opening at the end, so that my dad could get the bath that was on the wall, and it was only held in by one cut nail. If you’d had winds like we’d had the last few days, it could have blown down onto Mrs Thompson, who was the lady who lived downstairs, it could easily have blown down, it was just hooked on the wall! Also, when me and my brother were very young, my mum used to put us in the butler sink, and my brother was a bit taller and lankier than me, I was quite small, and I can remember my mum saying “Get your legs in! Get your legs in!” and he’d be saying “it’s hurting, I can’t get my legs in!” But you’d be sitting there in the butler sink and she’d be washing you. The only hot water came out of saucepans and kettles, we didn’t have a gas heater or gas water at all, this was what we boiled up with saucepans and kettles for bath night. We used to put our bath where my mum’s cooker was, and also the toilet came off of there, you couldn’t swing a cat in it, you had room for the cooker, then you had the butler sink at the other end then in between you had a draining board which just slightly nitched over the cooker, an enamel draining board, and then underneath that draining board my mum used to have a spin dryer. This would have been the fifties, right throughout the fifties, and that butler sink, originally it was one of them small yellow butler sinks, but then I think my dad had my uncle who was a plumber, put a big white butler sink in, this would have been the very early fifties. In the early sixties, ‘62, I started in the building trade as an apprentice plumber, and after about a year or so I fitted an actual stainless steel sink top in and done the plumbing to come underneath where the lead pipe actually came out of the wall. And we had a little gas water heater, which was over the sink, so when you washed your hair you could put it under the tap to rinse it, because me and my brother were both teenagers then, in the early 60s. S: We used to have a wash… I mean the sink was used for the washing up, and the cooking, and the washing, so you’d have to clear the washing up out of the way to have a wash or to wash your hair. You’d wash up as far as possible, then down as far as possible, then you’d take a bowl of water into the toilet to wash your possible! Because there’d be all people around! B: When we had that bath laid out in the kitchen, you couldn’t get into the toilet, so once the bath was full up and you were all having your bath in the tin bath, you couldn’t go to the toilet because you couldn’t move the bath as it was all full of water, and you couldn’t open the toilet door. So how did you get the water out of the bath? B: Down the sink. But Sylv’s dad, I always remember, when we was first courting, he had an ingenious method, he was a bit of an engineer, your dad, wasn’t he, he got this little old pump from work, didn’t he, a water pump, and he’d put the pump on the floor and plug it in, it was always on a lump of anti vibrating foam stuff, wasn’t it, I can still remember it. He used to put one end of the hose, the outlet, down the toilet, and he used to put the other end into the bath, but he used to have to prime it first, with water, and it used to take ages to pump it out but it saved all that bucketing out. It used to pump it down the toilet. I can still remember, ah it was funny.